a just found out another friend of mine is having a baby so i’ve got nursery decorations on the brain lately (which isn’t helping my baby-crazy-late-20s phase). i saw this fun mobile at spool a while back and have had it bookmarked for ages, hoping i’d find an excuse to make one. and now i have one! you can download the pattern for each fabric bird right here and then pick up some (clean, fallen) twigs from your backyard and use clear fishing wire to hang each bird. it’s a great way to use up leftover fabric (or those super-fun fabric packs from purl) and give a homemade, customized gift. click here for the full post at spool. Also, am in need of some contemporary fabric to make simple curtains that doesn’t cost a fortune – can you recommend any internet vendors? thanks!! I love this bird mobile! I’m going to attempt one for my neice. Thanks so much. Yay! I was looking for a cool but different mobile for the nursery! I pulled my hair out trying to make my own similar pattern a few months ago! I see how a few key differences make this one more successful than mine. Can’t wait to get back to making them! Once again Grace has been practically psychic with a post. I love this! I’ll be linking to this in The Daily DIY today, and making one myself! I’ve never really commented on anything like this before, but I love this site, and this idea…even to be used simply as a decorative piece. This is wonderful! I really love mobiles, and I’ve been looking for something to hang over my bed at school next year. This might be it! If you have more money than craftiness, you I found this mobile at ohmyeye’s Etsy shop for $150! I spent 2 hours this weekend trying to make a decent looking bird pattern ’cause I’m a poor grad student. I’m so excited ’cause this one looks so much better than the one I made! This is absolutely adorable, and is now at the top of my crafty to-do list! Thanks so much for sharing this. Just FYI–this is a great project, but not for babies as intended. If the baby were to get hold of it, they could dismantle the mobile, injure themselves with the sticks and possibly die of strangulation. Good lord- Debbie Downer much? I would think it’s implied that you shouldn’t be hanging this within reach of a baby, but rather a very safe distance above. Why does someone always have to get bent out of shape and super (death!) dramatic when something with the world “child” is posted? Can anyone point me toward the “fabric packs” from Purl? I’ve tried looking on the website, but I’m just not seeing it. PS: I love this project! Am totally making it! This is an awesome DIY idea, especially considering how much I love birds! This would be awesome in my little girl’s room. But one second thought, she’s at an age when she’d probably — make that definitely — try to pull them down. So I’ll have to find another place for my fine fabric friends if I decide to tackle this project. Try etsy- for reasonably priced fabrics. Dutch Girl Fabrics has some cute ones. These birds would make a great x-mas wreath or tree ornaments. Everyone I know is having baby toooo — I LOVE this idea. I want to give them something personal, yet still cool. Thanks for finding! Thank you just made them so quick and easy… I used rice to fill… I couldn’t wait to go to the shop for stuffing supplies tomorrow. worked out great it did make them and nice weighted. gah! love this! it would be cool to mix it with some different kinds of birds too, like an enamel one, a plastic one, etc. I’m afraid the link is not working – might be just me but can someone double-check it? Thanks so much! Great idea. The birds tails make me think of bow ties–I bet you could reuse old bow ties to make them! Does anyone know how these are attached to the sticks? They are so cute but attaching them could be my downfall…. These are just delightful and the PERFECT sized project that I need right now. I”m waffling in hesitation on a commissioned wall hanging and making a few of these would be just the thing to get me going! I just found this site…wowie what a gem! I absolutly love your blogs and these cute birds! I will deffinitly make some myself! thanks for this instructional! i love these little birdies; they’d be a great addition to a nursery or even my room! your instructionals are so helpful and lovely! Adorable and classy at the same time. I am a novice at sewing…but I’m going to try to make one of these for my son’s nursery. The room is blue and brown with sage green accents…so I’ll try to find fabric to match that. Any help on where to find fabrics online? Also, how do you attach the fishing wire to the birds??? Thanks! I just stumbled on this site and love it. 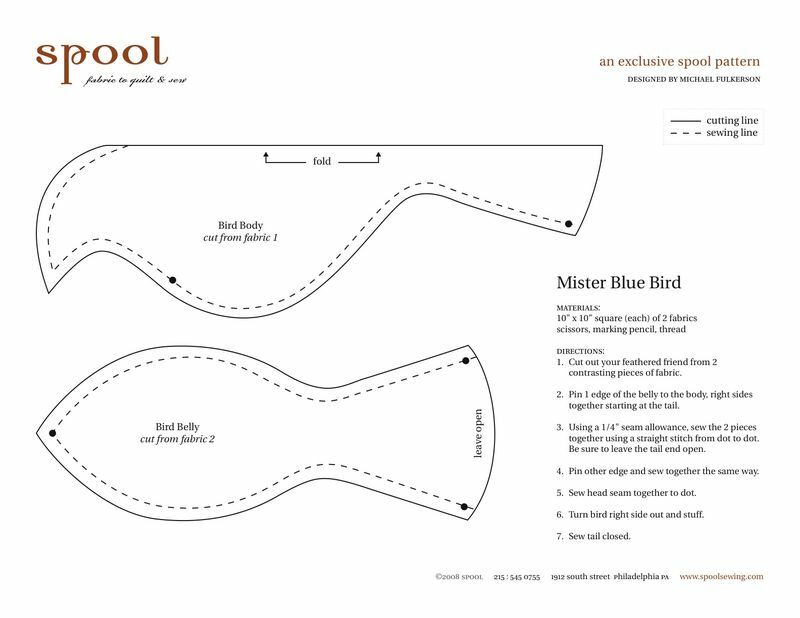 I’ve printed a copy of the pattern and will be making little birds like crazy… What a fantastic way to use up scraps of pretty fabric! I don’t think I’ll make the mobile though – I can think of a few other uses for them. also, I love your site. it’s beautiful and the colours are great. Wait…I was able to link to the pattern a few weeks back…but now it doesn’t seem to work??? I never printed the pattern out…so hoping this will be fixed or someone can check it out? this is a link from someone else’s blog so i’m afraid you’ll need to contact them for information on the pattern. so sorry! In the instructions for the bird, it says to sew the tail closed… but when I look at your birds, I don’t see where the sew line is! Am I just not seeing it because your stitches are so tiny and perfect? Where is the tail seam?! How do you attached the birds to the branch? I can’t wait to do this for a girlfriend of mine having a little girl soon. I just found this project and would like to start it after the holidays – I’m already looking forward to spring! Do you happen to know the name of the fabric that is red, blue and orange – overlapping dots? Thanks! I just finished this project for my daughter’s nursery. I used brightly colored felt and it turned out really cute. I sewed the birds onto the branches using fishing wire and a needle. It was a little bit of a challenge to get them all balanced. I love these mobiles . . . I know this may be against the rules but do you sell completed mobiles or do you know who may? I am looking to buy a completed mobile as well. Any sellers? I am a future-mom-to-be and would appreciate any help!!! Someone found this pattern and had me make it for them. It is SO cute I think I am going to make one for my craft room too! Has anyone offered to make you a mobile yet? I’m working on one for a friend at the moment, and then will be putting it up as a custom option in my etsy shop (so people can customize what colors they want). Keep an eye out there if you still need one! I ran across this post MONTHS ago when I was only a few months pregnant. I’m now expecting in 5-ish days and sat down two weekends ago to make this awesome project a reality and I love it! Check out my new blog to see the results…. Just wanted to say thanx for the post and info. I just found this yesterday and have turned out four birds here and there today due to the snow storm. This project is so whimsical but it’s also the stuff of art galleries. Planning on making a mobile for the corner of the living room for our apartment. Thanks Again!! it’s so cute how did you do it. .
And if you could put it on my site. can anyone tell me how to finish their tails so they look so neat? i am stuck at how to stich up their tails. I just finished my birds, haven’t assembled the mobile yet but to avoid hand sewing I did a zig zag stitch on the tails & used pinking sheers to cut the edge. I love this project, I’m not very good at sewing, though. A few months ago, I converted the Spool bird pattern from a sewing project into a paper craft. Paper I can handle. How cute are those birds. Very creative! the birds are really adorable! Thank you for the link. The bird-mobile is wonderful … i will make it for spring. This will go perfect with the dandelion puff and dragonfly theme for our nursery! I can’t wait to start making these adorable birds! Just finished making my 13th bird. Now to find the perfect branch. I’m attaching mine to a big branch and suspending it over the guest bed with white lights in it. I thought it’d be a nice night light for grandkids or guests. Can’t wait long to make them. Hope to succeed in making these splendin birds. I can’t see the patterns! They are blocked! Thank you Maxime for sharing that link to the bird pattern! This pattern is just what I am looking for – so cute! For some reason I cannot open the link – can someone help? Very much appreciated! I know this is old but can someone help with finding this website? At least point .e in the right direction. This is adorable andneed the pattern. Please and thank you.